Kurt Busiek’s collaboration with Alex Ross on Marvels supplied a fresh way of looking at superheroes in 1994, which was no mean feat. He detailed important occurrences from Marvel’s history, often seen and often mentioned, but critically supplied them from the viewpoint of the man in the street. Just what would it be like to see costumed characters with super powers battling in New York? That’s his starting point for Astro City. In six chapters Busiek creates an entire new superhero mythos. Again, his narrative method is clever. Instead of explaining everything, past events and former heroes are referenced, in the manner they would be in standard superhero comics. This is sometimes in oblique terms, other times in a more tantalising manner, yet they cement a credible back story for new characters. Over the course of later volumes some references will be explained, while others remain mysterious. Busiek’s other benchmark has faded. When he conceived the series, the content of too many superhero comics had been overly influenced by the grim, violent surface veneer of successful material, without absorbing the greater depth. 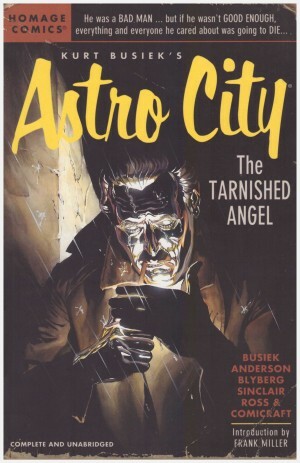 Astro City would have a deliberately lighter tone. 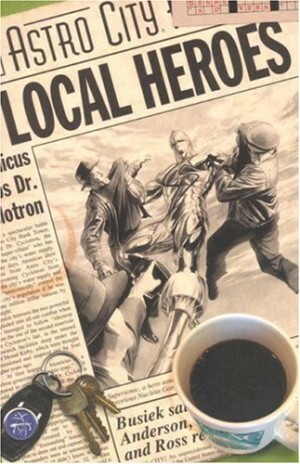 The wheel has turned, and Astro City sits comfortably among today’s more optimistic superhero product. Astro City is an amalgam of Marvel’s New York and DC’s Gotham and Metropolis, with various districts, and distinctly familiar with superheroes and the supernatural. Busiek, in this opening volume at least, sticks much to his Marvels template about what it’s like for ordinary people living in a world populated by superheroes, whether it’s interacting with them or just seeing them flying overhead. This is particularly well reversed in the opening chapter, when Astro City‘s Superman equivalent, goes about his daily business. Brent Anderson is the illustrator. His work is naturalistic, but not to the photo-realistic level of Alex Ross, who provides all covers, and there are occasionally glimpses of Gene Colan’s wispiness in his line. Admirably, having chosen his collaborators, Busiek has determined all Astro City material will be by him and Anderson, with Ross contributing covers and to character design. If this requires an irregular schedule slotting in around other commitments, so be it. To date no-one else has been granted access. 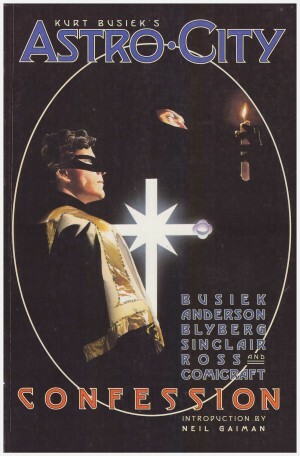 A downside of what Busiek’s created is that it requires recognisable archetypes for maximum effect, and so the originality lies completely in the background and the narrative approach. 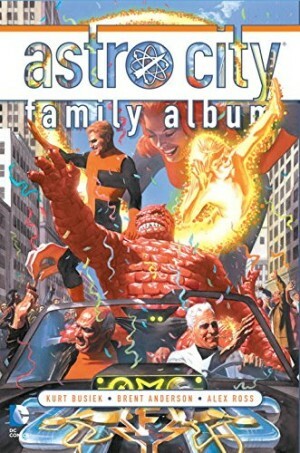 The superheroes he’s created have very obvious analogues, so Life in the Big City‘s original publication under the Homage imprint was very apt. The other problem is that Busiek’s not very good at distinguishing his narrative voices. The occasional dropped ‘g’ ending a verb is hardly sophistication. 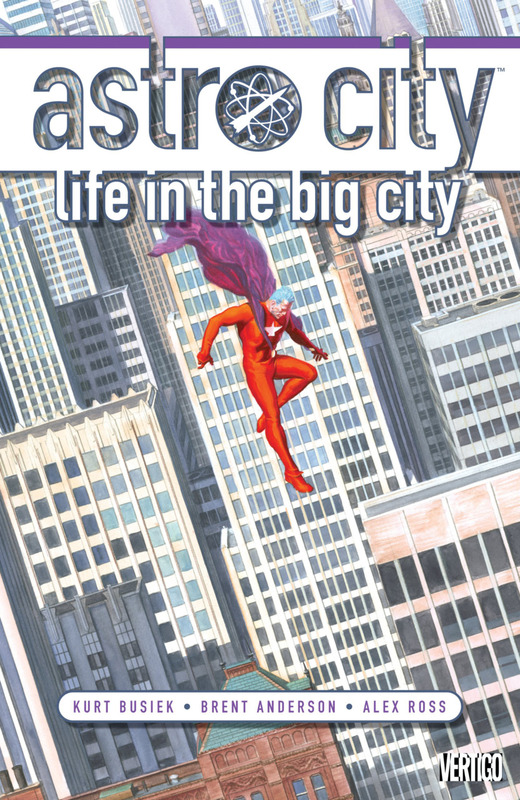 These aren’t fatal flaws, and for those who love superheroes as much as Busiek Life in the Big City, and indeed most of Astro City, is an enjoyable trip into a new, yet comfortingly familiar world. the ‘Safeguards’ chapter won an Eisner Award in 1996. 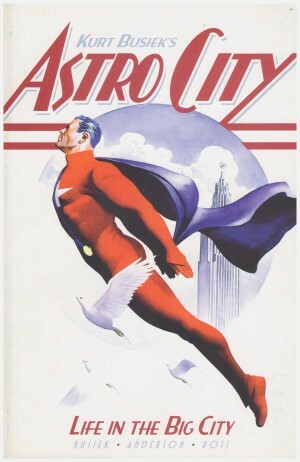 With the exception of The Dark Age, spread over two books, Astro City volumes are self-contained, and don’t require the reading of previous material. Those wanting to follow the original publication order, though, are directed to Confession.